On Sunday December 6, 2015, Ashland Museum will conduct two guided walking tours through Historic Downtown Ashland, some Historic Ashland neighborhoods, and a tour inside 600 S. Center Street, where we will have light refreshments before returning to the Museum. The 90-minute tours will begin at 2:00 pm and 4:00 pm at Ashland Museum, 105 Hanover Avenue. Cost: $25 in advance, $15 for museum members. Reservations and prepayment are encouraged. Beginning at Ashland Museum, 105 Hanover Avenue, each tour will lead you through the Historic Downtown area, passing parts Railroad Avenue, including the Iron Horse Restaurant and the Ashland Station. We will talk about the original owners and the architectural styles you will see along the way. A stroll through the Center Street and Howard Street residential neighborhoods will emphasize the architecture there and the new uses of the venerable old buildings. We will stop for refreshments at 600 S. Center Street, formerly Railroad Avenue. 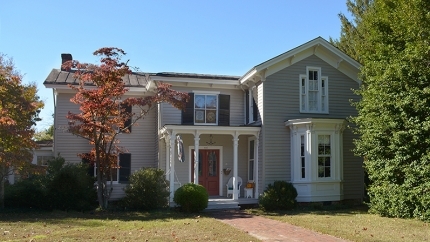 This antebellum home, owned by John and Becky Longmire, was remodeled in the 1870s with Italianate details. It was nearly demolished in the 1970s but the Longmires saved it by renovating it to suit modern day living without destroying the historic integrity of its architecture. Originally owned by the Charles Stebbins family, owners of the famous Stebbins Store in downtown Ashland, the home gave its name to Stebbins Street, which borders the property on the north. We will stop there for a wine and cheese reception before strolling down Center Street to Howard Street, the original southern border of the town before returning to the museum. The Historic Downtown Business District located along the railroad tracks has not changed in appearance since 1913. We will talk about the new and old uses of these structures. The neighborhood of S. Center and Howard Streets includes architecture from the 1850s, when Ashland was dominated by RF&P’s Ashland Hotel and Mineral Well Company, a healthful resort for Richmonders. But it also includes some fine examples of styles from periods after the Civil War when Ashland exploded with development. You will see styles including Italianate and Second Empire from the 1870s, Colonial Revival from the 1880s and 90s, and Craftsmen from the 1920s. There will be two tours on Sunday, Dec. 6, 2015 one starting at 2:00 pm and one starting at 4:00 pm. Each tour will take about one hour and a half and will begin and end at Ashland Museum, at 105 Hanover Avenue, next to Ashland’s Red Caboose. It is easy to become engrossed in the hectic holiday rush and forget what yuletide can mean. Pause for a moment on December 6, and join us for a leisurely tour of an old-fashioned town at Christmastime. Tickets are $25 in advance, $15 for museum members in advance. Reservations are encouraged, as each tour has limited space. Questions? Contact us at 804-368-7314, or info@ashlandmuseum.org, or via our Contact page.